A 25-year-old man sought in connection to a shooting last week in south Wichita has been captured. 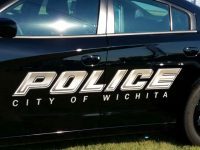 Wichita Police say the man was wanted for the shooting that was reported around 1 a.m. Wednesday in the 2400 block of South Glendale. When EMS arrived at the scene, they found a 21-year-old man who had multiple gunshot wounds to his upper body. He was taken to the hospital where he remains in serious condition. Police say the victim was with the suspect in the parking lot of an apartment complex in the 5001 block of East Pawnee when the suspect shot him. He was able to run to an address on South Glendale where he sought help. The suspect was found Monday in Riley County and taken into custody for attempted first-degree murder. Wichita Police say they will be presenting their case to the Sedgwick County District Attorney’s Office. KFDI News is withholding the man’s name until he is formally charged.